Local business owner and #1 bestselling author, Patrick O’Donnell, presents business strategies and techniques for utilizing automated marketing technology to increase leads and sales. Attendees receive live training and partnership opportunities. Atlanta, GA [July 11, 2012] On Tuesday, July 24th, Patrick O’Donnell and RevStream Marketing will host a training session for professionals at The Work Spot in Duluth, GA. The live event will last from 11:30 to 1:30 p.m. Cost is $9.99, lunch included. The 7 Steps to Revolutionize Your Business event is designed for authors, speakers, small business owners, VPs of Marketing, Sales Managers, and other professionals seeking information on how to increase leads and sales through automated marketing technology. 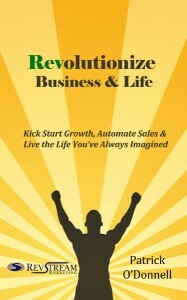 Event attendees will learn Mr. O’Donnell and RevStream Marketing’s 7 steps to revolutionize a business. Key points include utilizing 7 different techniques to capture leads, communicating with leads across multiple channels, and converting leads to sales through the use of automated systems. Participants will have the opportunity to network with other attendees, learn from actual case studies of revolutionized businesses, and possibly have their company selected for immediate strategy “hot seats.” Information on partnering with RevStream Marketing will also be detailed at the end of the training session. Atlanta native Patrick O’Donnell has had great success in the Marketing world since graduating from Georgia Tech in 1999. After graduation, Mr. O’Donnell started his own internet marketing firm, which ranked as the top selling franchise in the US. He worked with an Executive Coaching firm, and then as VP Marketing with a local firm. He recently authored the #1 Bestseller Revolutionize Business & Life: Kick Start Growth, Automate Sales & Live the Life You’ve Always Imagined. Currently, Mr. O’Donnell is the Managing Director of RevStream Marketing. Focusing on cutting-edge marketing technology, the Business Growth Strategists at RevStream Marketing create automated lead capture and sales conversions as well as train teams on system implementation. RevStream Marketing clients receive marketing campaigns and training from the top talent in Marketing. RevStream Marketing’s proven system has generated millions of dollars of new business for its clients.